This card was practically complete weeks ago including a handlettered sentiment written with pen and ink. Unfortunately after leaving the ink to dry overnight I brushed my hand across the lettering only to see it smudge across my one layer card! I cut the strip of teacups out of the ruined card front and set them aside as I had other projects to complete. When I pulled them out again I decided to create an embossed mat to frame the teacups top and bottom then stuck the teacup panel on the embossed panel and then onto a new cardfront. 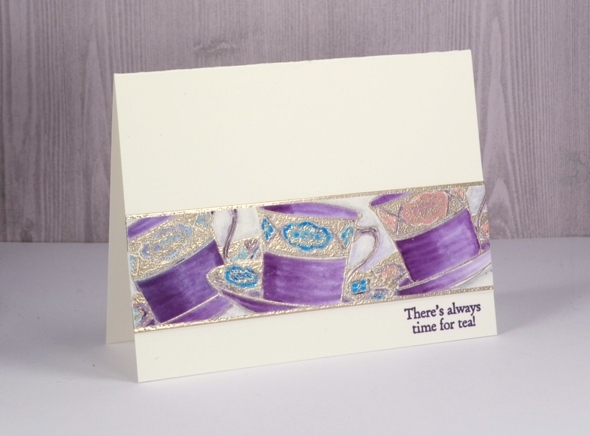 I added a sentiment from the ‘cup of tea’ stamp set and finally finished my card. The teacups are stamped in versamark and embossed in platinum powder. After embossing one cup, I stamped and cut a tea cup mask, positioned it over the first cup then stamped a second and a third cup. I did all the colouring with tombow markers. When finishing the card a while later I tried my new versafine clair ‘monarch’ ink. I have always been happy with my versafine inks so I wondered what might be different about the new versafine clair inks. I have bought five colours to start with and so far I am very impressed with the sharp detailed stamping and no need for a second impression. And by the way if you like a little sparkle, perhaps with embossing powder or something bolder, please check out the ‘Sparkle With Us’ challenge I’m hosting with The Foiled Fox. We’ve stretched it out for a wee bit longer so you still have a couple of days to join in. Beautiful teacups. I need to up my game for sure! 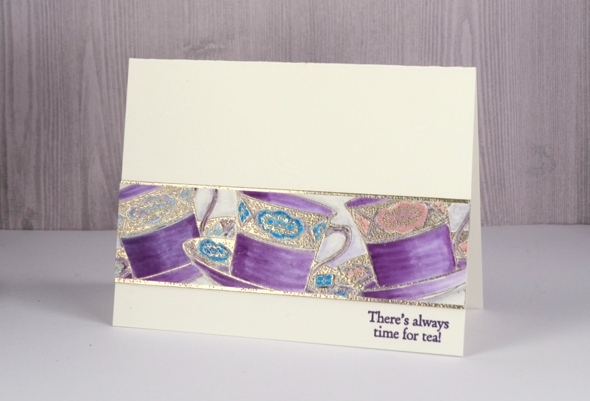 What a charming and elegant card the teacups make Heather. I certainly agree with the sentiment. Again you have shown how to create success from a disappointment. Such inspiration. Thank you.